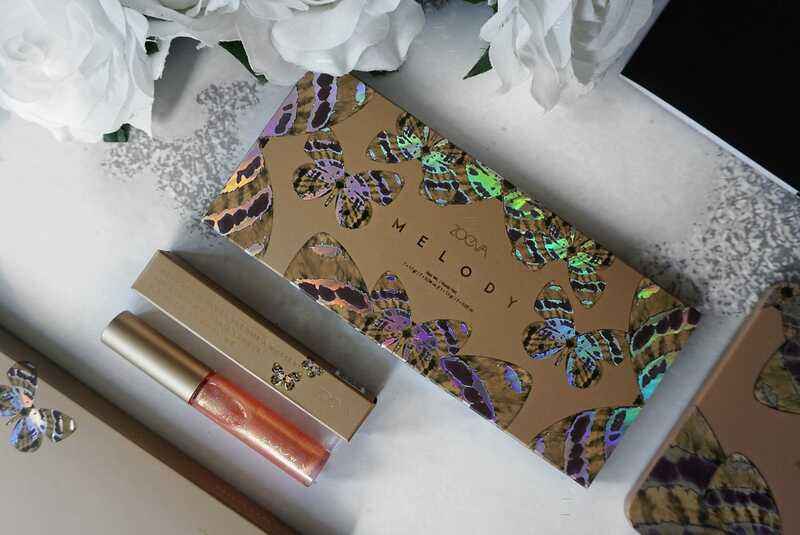 It is with great anticipation that I have the pleasure to introduce you to the Melody collection by ZOEVA. The ZOEVA Melody collection includes an eyeshadow palette, 5 lip glosses and a handheld mirror. The Melody collection is available for purchase now. If you rather watch my YouTube review. 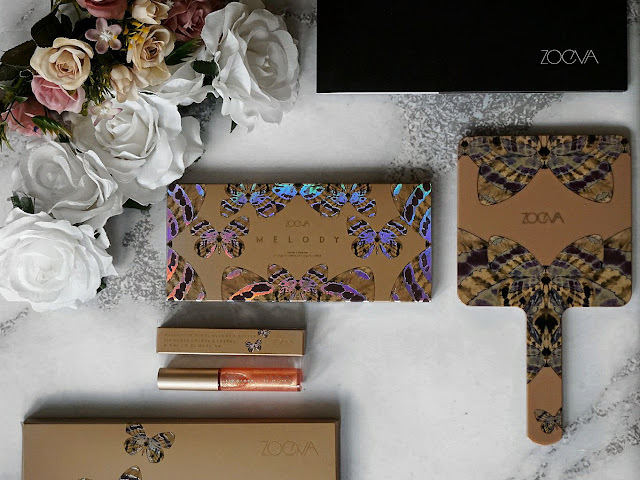 Hats off to ZOEVA beauty for coming up with my favourite packaging design so far. The packaging is beyond exceptional and high in quality. The concept of the packaging surrounds the butterfly being able to transform herself in a wonderful and elegant being. They went full force on the high quality and finish of the packaging to the point that as soon as I laid my eyes on the collection I was sold. The packaging is very consistent and well thought through. Perfect for this spring and summer season for sure. My first reaction when opening the Melody palette was complete and utter fascination. 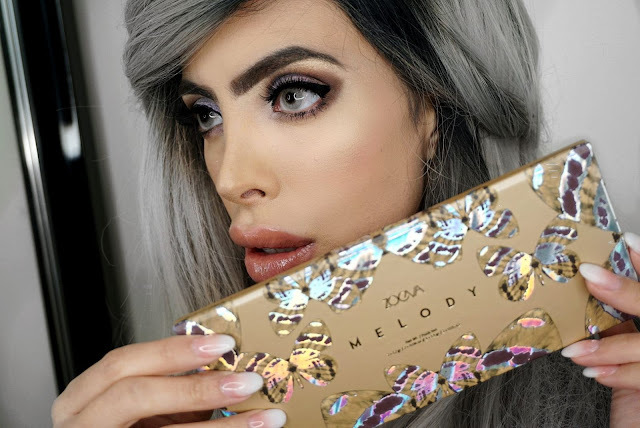 Did ZOEVA just release the best all rounder palette! I couldn't believe my eyes. All the basic shades I envisioned within one palette were there!! 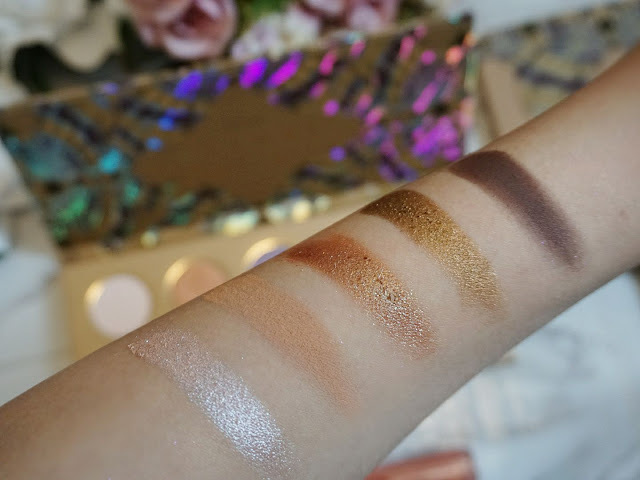 I hate sifting through different palettes for the basic browns or shimmers. All the ones I love reaching out for were all in one palette. The biggest question however is, will the colour payoff and killer blending I desire be there! 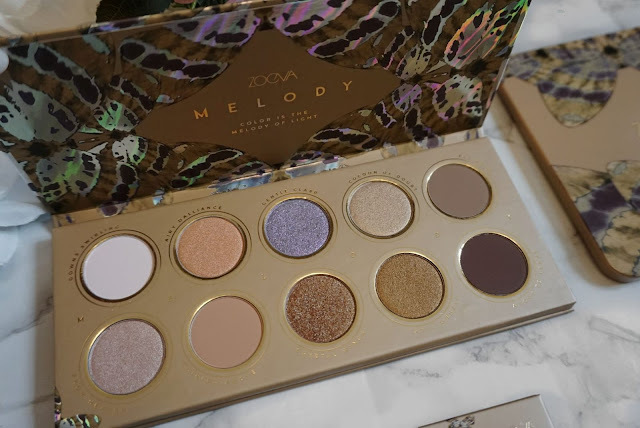 The Melody palette contains 10 shades. The shades range from a porcelain pink to a rich espresso! Exactly my cup of tea or coffee shall I say!! 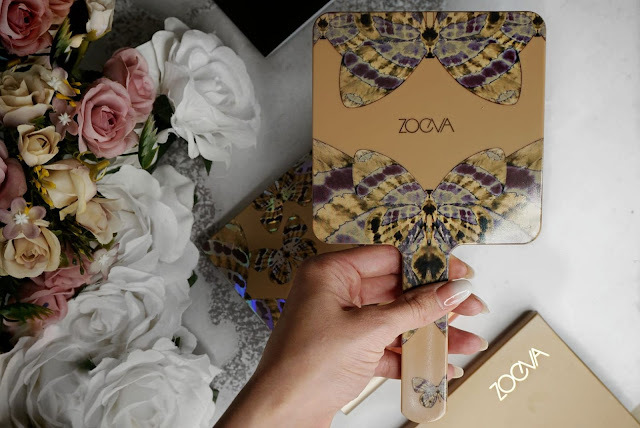 They kept the concept very much alive as you will float like a butterfly in these exclusive shades created specifically for the ZOEVA Melody collection. I can see exactly why you would float like a butterfly! The reason is because it's so beautiful and you would be literally with your heads in the clouds, a bit like when you are having a beautiful dream. The Melody ZOEVA collection palette includes 10 eyeshadows. 4 are matte , 3 are satin , 2 are duochrome and one is of a shimmer consistency. I love how it's not all shimmers and glitters but is a WELL ROUNDED PALETTE, when it comes to types of pigments. This is porcelain pink with glitter. The colour payoff is incredible. When swatching it only takes one swipe! On the eye the result is the same and it is very pigmented. This shade works great to make your look pop. This is a Satin delicate apricot. Very smooth to Swatch and again the colour payoff is outstanding. 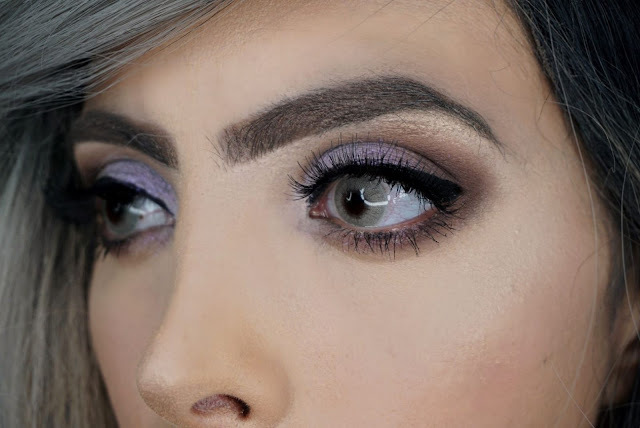 I found it very easy to blend and a wonderful colour to use on your whole eyelid. This is a Satin cool blue with glitter. Again as per all the shades it's very pigmented. 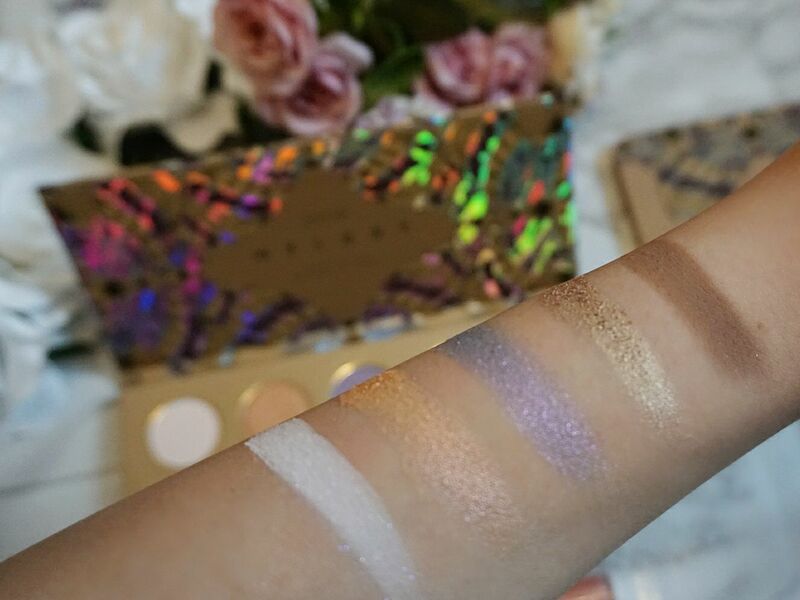 It is so beautiful to swatch and even more beautiful on the eye. I particularly love this colour either to be used on the whole eyelid, on the middle of the eye lid for a halo effect or the inner corner of the eye. This is a Satin antique gold. The colour payoff is insane on this one. Probably the most beautiful golden tone I own not only in terms of colour payoff but also shade. I found that not only you can use this shade on your eyes but I used it as a highlighter on my face and eyebrow bone. It gives a pop to your finish. This is a Matte cool ash brown. I adore that you have a cool ash brown in this palette. It's such a good shade to have in all palettes. Browns are so great to create dimension on your eye. The colour payoff again was wonderful. It was very easy to blend and to work with. It's the perfect shade of brown that works well on all skin colours. You can use this shade on your upper and lower lid. Another great idea is to use this as an eyeliner with a flat eyeliner brush when you go for a very basic and effortless look. This is a Duochrome rose satin base with icy blue shift. The great thing about Duochrome shades is that they look fabulous on the entire life or inner eye corners. The colour payoff was wonderful on this one. Amazing shades of ice blue and rose shades as the light hits it. This is a Matte sandy maple brown sugar shade. It is a very pigmented shade and wonderful as a base colour in the outer corner of your lid. You can use it also to blend out the darker browns in the palette. Again, very easy to blend and a must have shade in every palette. This is a Duochrome rust-red satin base with a golden green shift shade. This is the perfect colour for the eyelid and inner corner of the eye. This variation of colour from rust red and golden green is the perfect combination of luxury. I would simply even wear this on its own on the whole lid with some mascara on the lashes. It's Perfect to top off the central halo of a cut crease. This is a Shimmer golden honey bronze shade. This is a great colour for the summer and works well with any skin tone. I find that you can use it in many ways including on its own as well as in a cut crease look or halo cut crease. A Matte rich espresso brown shade perfect for every occasion and for the necessary build up of dimension to any eye look. You can use it in the corner of your eyelid and lower lash line, as well as using it as an eyeliner. Can you see how beautiful and easy they are to swatch? 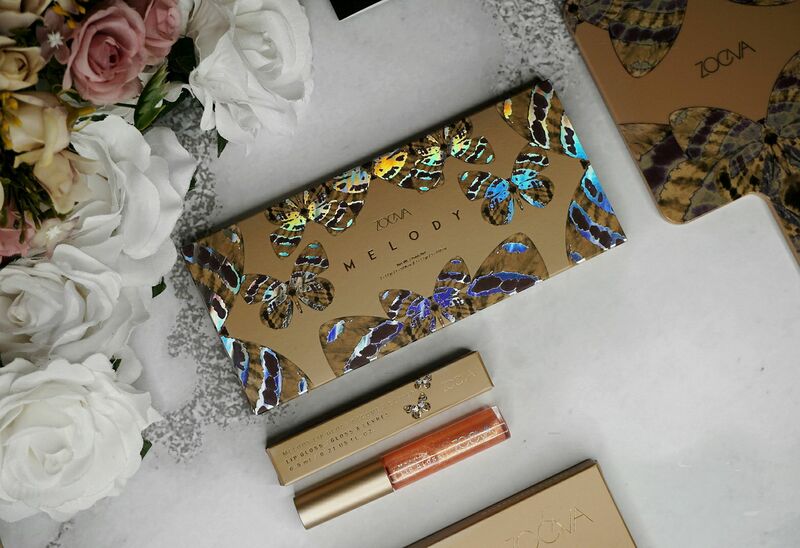 The ZOEVA Melody palette shades are all high in pigment, easy to blend and do not contain nor parabens nor perfume. Can you believe it's a made in Italy product? No wonder the quality is so high! Finally a brand other than Jeffree Star that does a mirror for their collection. 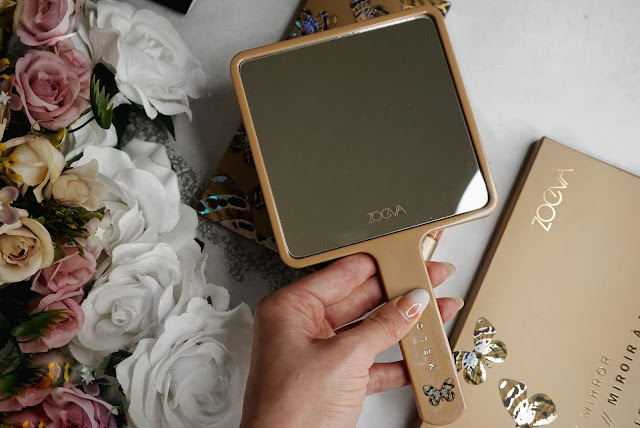 The mirror is high quality hand held mirror with the ZOEVA Melody collection theme design. This is a limited edition accessory so if I were you I'd get mine as soon as possible. It looks beautiful on camera and is the perfect accessory to take with you everywhere you go. I particularly love the butterfly theme and how they decided to not have it matte rather than shining especially because when you film your YouTube or instagram videos it can be distracting. The price is reasonable if you consider that Jeffree Star's simple design retails at double this. 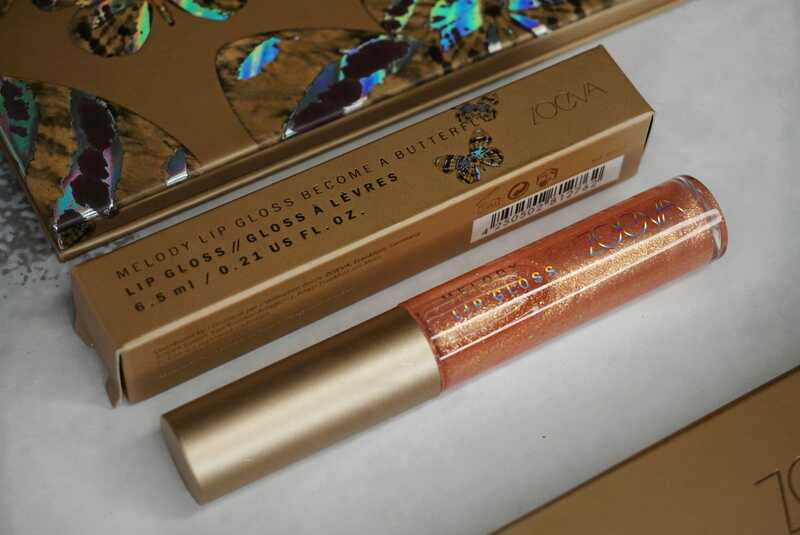 This is a clear gloss with rose golden sparkle. 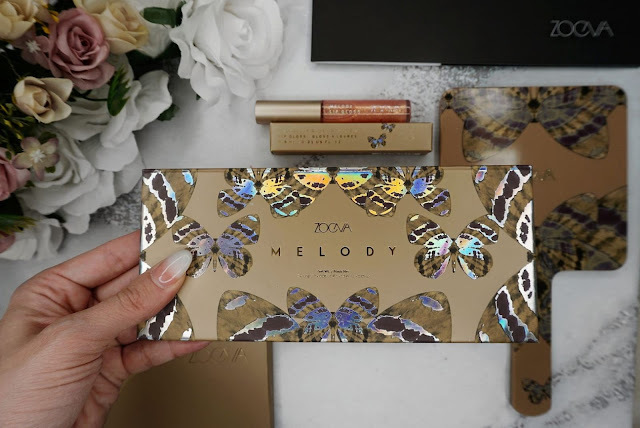 Again as per all the Zoeva Melody collection this is a limited edition piece. This is their first ever lip gloss with an ultra shine finish. 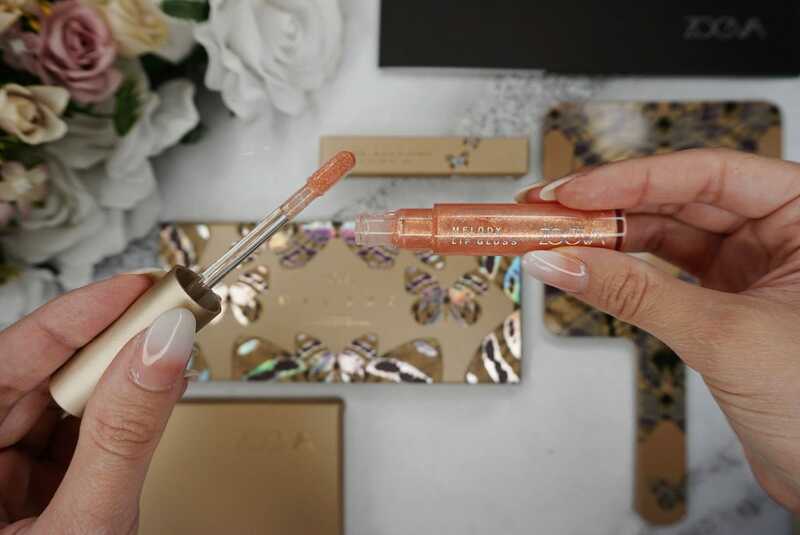 This particular lip gloss contains a rose golden glitter which works well both on its own and as a topper. It makes your lips look volumptious and juicy. 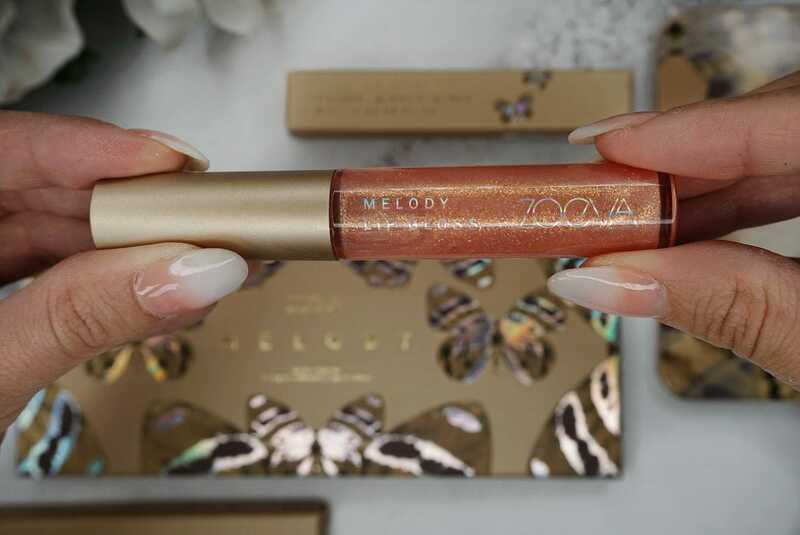 The become a butterfly lip gloss from the ZOEVA Melody collection gives your look a perfect finish. They have 4 more gloss types which you can choose from. 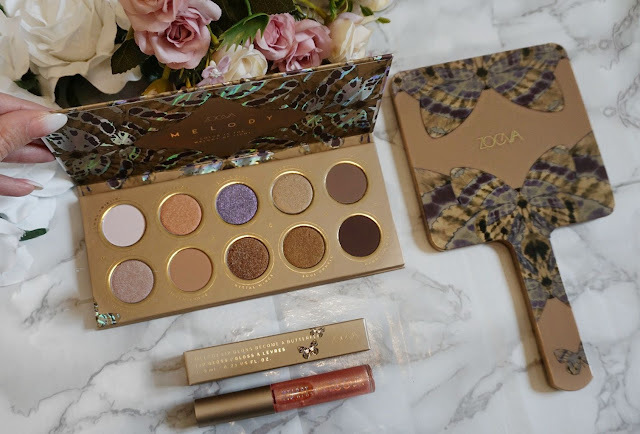 I created a look which definitely embodies the ZOEVA Melody collection concept. Creating a cut crease look fit for any event that will definitely blow people's minds. I used most of the shades and as you can see the final look was outstanding. My lips were topped off with the "becoming a butterfly" lip gloss which gave it that extra kick. I am blown away with the quality of the ZOEVA Melody collection. 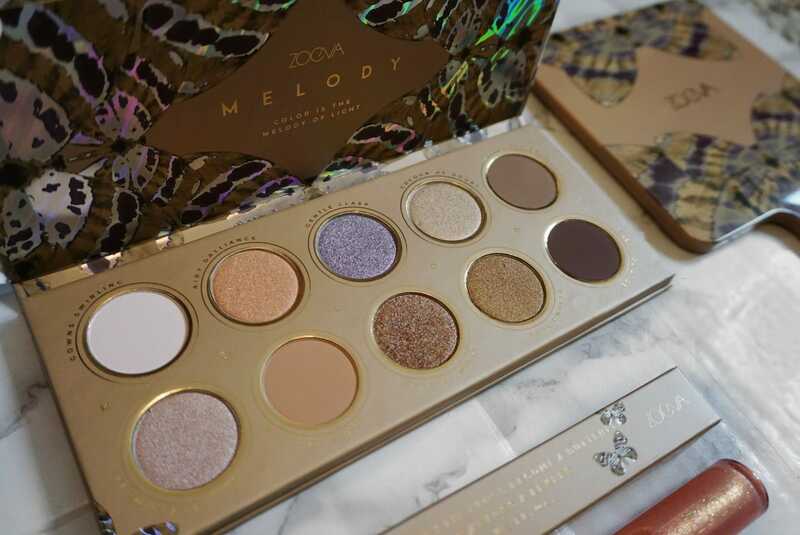 The Melody collection palette by Zoeva is a must-have piece. The quality of the pigments is outstanding, they are highly pigmented and free from parabens and perfumes. Perfect for that sensitive skin. The pigments in the Melody collection are extremely easy to work with and to blend. Even a make-up novice would reap the benefits of using this palette. I love that it is a well rounded palette with a different selection of shades types inclusive of duochromes ,mattes , stain and shimmers. 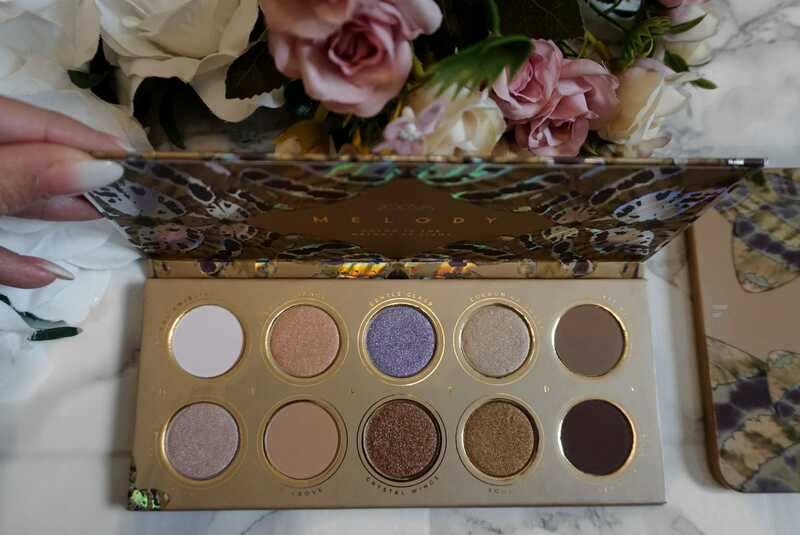 Probably the best palette I have purchased this year as all the shades are so beautiful and useful for most types of looks whether it's an everyday look or an evening look. The mirror is beautiful and definitely worth the purchase as it is a piece you won't be able to do without. 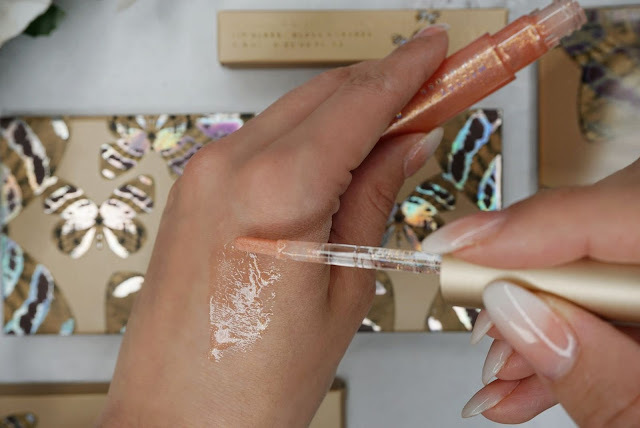 The "becoming a butterfly" lip gloss is beautiful and luscious. I definitely will be looking into purchasing the other 4. I am completed besotted with the ZOEVA Melody collection as a whole not only in terms of quality but also in terms of price point. I am so surprised with how affordable this collection is. "Have you purchased this collection? What were your thoughts? If not, would you buy it." "This is not a sponsored review and all opinions are my own."